Back row, left to right: Frs Alan Canoneo, Roy Marana and Gus O’Driscoll. Front row: German Patiga, Raulyn dela Pena Estalane, Bembolio de los Santos and Fr Joel (a diocesan priest). The Filipino members of the Society of African Missions, their family and SMA Supporters are preparing to celebrate the Silver Jubilee of the establishment of the SMA in the country with the largest Christian population in Asia. Part of the Jubilee celebrations will see the blessing of the new parish pastoral centre at Good Shepherd Parish, Las Piñas, Manila on 15 May 2011. To celebrate this landmark in the history of the Society I draw on an article written by Fr Gus O’Driscoll SMA giving a brief overview of the past 25 years. In November 1984, Rev. Fr. Patrick Harrington SMA, Superior General, visited Manila, and in a meeting with Cardinal Sin, he took special note of his requests for priests. He toured a number of proposed sites for a parish. Las Piñas appeared to be the area most suitable to our needs, and this was recommended to the General Council when Fr. Harrington returned to Rome. In May 1985 the Plenary Council approved this plan and the first two SMA priests, Frs John McCormack and Pat Kelly arrived in the country in September. Both of these brought their mission experience in Liberia, west Africa to their new work. Such were the beginnings of the SMA in the Philippines. Just eight months after their arrival, the parish of The Good Shepherd was officially inaugurated on 26 April 1986. Construction of the parish church began by Easter 1987; twenty months later it was officially blessed by Cardinal Sin, on 8 January 1989. That same day, the four-bedroomed convento was also blessed. A historic day indeed in the life of the SMA in Asia. In 1987 a house was purchased in New Manila, Quezon City, with a view to recruitment of candidates for the missionary priesthood and the setting up of a formation program; it was officially opened on 1 December 1987. A second floor was soon added to the existing building. Since the beginning, our philosophy students have attended Christ the King Seminary and our theologians have taken their courses in nearby missionary institutes. The Vocations Office is also situated in this house. The third phase of the SMA thrust in the Philippines came to fruition when the International Spiritual Year (ISY) Centre in Silang, Cavite, was blessed and opened on 11 February 1992. Built on a 2.8 hectare site amid coconut and other fruit-bearing trees, it is an ideal location for the Spiritual Year programme, offering space, silence and a pleasant climate. Filipino and Indian students come together for one year to deepen their life of prayer, to grow in self-knowledge, and to discover more about the history and charism of the Society. The centre is also used by groups of religious and laity for days of recollection and retreats. The ISY shows the close cooperation between the Filipino and Indian branches of the Society. Silang provides an opportunity for seminarians from both countries, and other English-speaking parts of the Society, to take time out to learn more about themselves, the Society and Africa in preparation for a Pastoral Year (Stage) in Africa and for Theology studies in preparation for priesthood in the SMA. The present Director of the ISY is Fr Robert Sagayam SMA, of the Indian District-in-formation, assisted by Fr Alan Cañoneo SMA. There are four students (2 Filipino and 2 Indians) preparing to take their First Oath of Temporary commitment in the SMA (pictured with Fr Robert). We wish them every blessing on their journey. The SMA presence in the Philippines has encouraged the local church to develop a greater missionary consciousness. In setting up our SMA Mission Partners, we are able to help young Filipino men realize their dream of becoming SMA missionary priests. After ordination, they are assigned to Africa. At present Filipino members work in Ghana and Tanzania, in areas of primary evangelization, remote and poor, where people struggle to find the basic necessities of life. Finance is needed to sustain our missionaries and to support their projects for the local communities. We are grateful to our Mission Partners for their assistance in our missionary work and in the formation of our seminarians. We encourage more people to be our partners in spreading the gospel and in solidarity with the missionary church, as it continues to change the lives of many people, especially in Africa. As the Mission Partners continue to expand the Philippines DF relies, for most of its income, on the wealthier parts of the Society. The Irish Province, through the generosity of its supporters, contributes to the SMA Development Budget which provides financial support to the poorer parts of the Society. In the past twenty-five years the Philippines DF has moved from relying on ‘foreign’ SMAs to taking responsibility for its own administration. 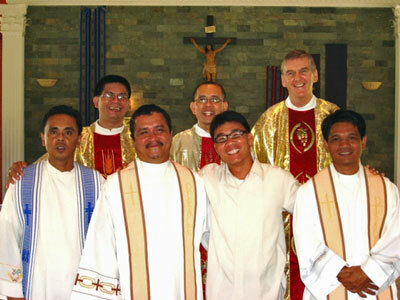 Fathers John McCormack (Ireland), Jos Pijpers (Holland) and Fr Gus O’Driscoll (Ireland) led the Philippines unit until the appointment of the first Filipino Superior, Fr Roy Maraña, in 2008. 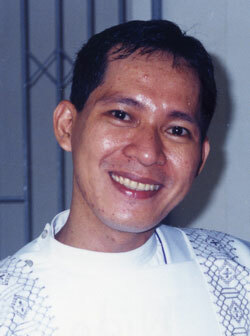 He was succeeded as DF Superior last January by Fr Alan DeGuzman. Fr DeGuzman (pictured) is assisted by Fr Jerson Pineda as Vice Superior and Fr German Patiga as Councillor. The DF Bursar is Fr Alan Cañoneo.